Our patron saint was originally named Joseph. He hailed from the island of Cyprus but became an early member of the Christian church in Jerusalem. He sold some property he owned and devoted the proceeds to the church. Either for this reason or because of other services, the apostles nicknamed him Barnabas, which means “son of encouragement” or “son of consolation.” This is recorded in the Acts of the Apostles (the fifth book in the New Testament), Chapter 4, verses 36-37. Some time later, when Saul (renamed Paul) was converted from a violent persecutor of Christianity to a disciple, it was Barnabas who vouched for him to the apostles. Acts 9:27. 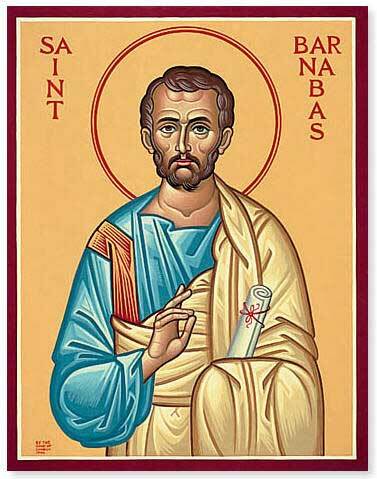 Barnabas was sent by the apostles to report on the growth of the church in Antioch. He sought out Paul, who was living in Tarsus, and brought him to Antioch where they worked together. Acts 11:19-26. Barnabas accompanied Paul on his first missionary journey to Asia Minor and he joined with Paul in arguing that non-Jews should be welcomed into the church. Acts 13-15. Barnabas undertook a second missionary journey to his homeland of Cyprus. Acts 15:36-39. After that he fades from the historical record, but it is clear that Barnabas was highly esteemed in the early church. Luke says (Acts 11:24) that he was “a good man, full of the Holy Spirit and of faith.” May the same be said of us.